Georgia Tech’s Language Institute, in conjunction with the Center for 21st Century Universities (C21U), has launched a new app aimed at helping non-native English speakers improve professional communication for successful business interactions. The app, Speak English Professionally, is now available for download through both the Apple App Store and Google Play. The app is available for free and users are provided with a wide variety of self-paced and individualized learning modules on speaking English in a business setting. Videos and quizzes are designed to assist users with social and interviewing skills based on scenarios they may encounter in business settings primarily conducted in English. The Language Institute and C21U partnered with e-learning production company Onlea to produce the app. 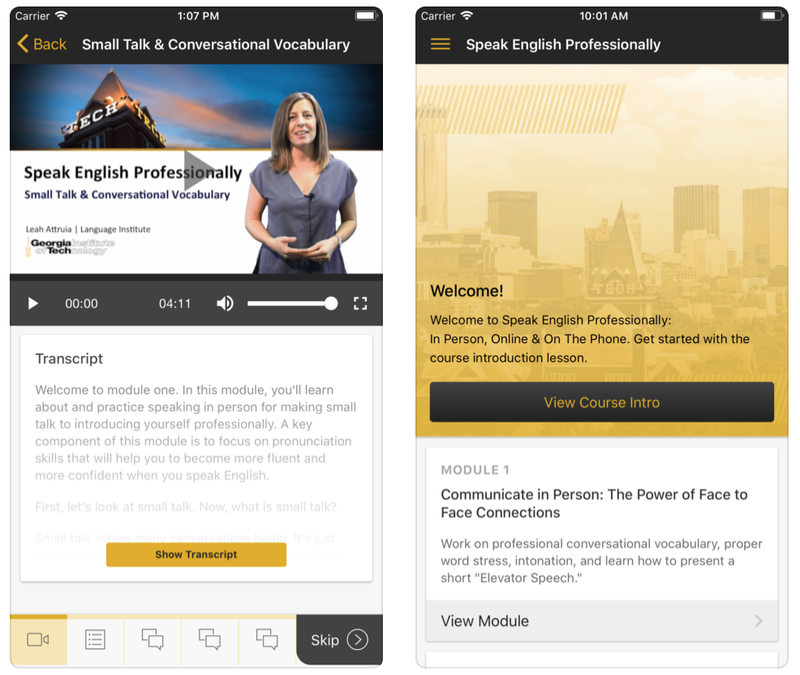 The course materials are based on Georgia Tech’s preexisting Coursera specialization courses that are focused on speaking English professionally. Since 1958, the Language Institute has offered high-quality English language training for students preparing for academic work in the United States and other individuals who hope to improve their language skills for social reasons. As a unit of Georgia Tech Professional Education, the Language Institute also serves professionals looking for career improvement through better language skills. While many lessons still take place in a physical classroom, resources like language learning MOOCs and apps allow the Language Institute to effectively reach a greater number of learners. To try the app out for yourself, you can visit the Apple App Store or Google Play and download Speak English Professionally for free. The app requires iOS 9.0 or later and is compatible with iPhone, iPad, and iPod touch. You can learn more about the Georgia Tech Language Institute’s work and learning opportunities by visiting the GTLI website. Find out about C21U’s role in educational innovation at Georgia Tech by visiting the C21U website.